"Sitting here at the Hortons, so you know this is important"
The title of this entry is a line from the song 'Vancouver Divorce', a track off of Gordon Downie's (aka singer of the legendary Tragically Hip) first solo album Coke Machine Glow. As a songwriter that often reverts to the Canadian cultural landscape to get his point across in his songs, in this case Downie's reference to the 'The Hortons', if you haven't guessed it, refers to that all-Canadian house of coffee and donuts and other gastronomical treats known as Tim Hortons. 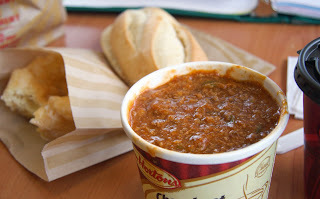 My favourite among those treats, by the way, is the chili, served up with some of that country fresh bread which you can then dip into the chili ... oh that's tasty! But anyway, in Canada, it's pretty well know that Tim Hortons is an important gathering location for many; a place of conviviality where friends and acquaintances come together to sit around and discuss, gossip, reminisce, etc. As Downie points out, if it's being debated at 'the Hortons' it's got to be 'important'. Now I highly doubt Downie was thinking of the Portuguese when he was putting those lyrics together, however, if there's an ethnic group that loves to gather at 'the Hortons', it's the Portuguese. I first witnessed this when I used to live in Prince George, B.C., among the local Portuguese community there. At first I thought that this was perhaps a local phenomenon, after all the older members of the community had to meet somewhere. Recently, however, during trips to Toronto and Montreal, I discovered that the same phenomenon occurs in these cities as well. In Montreal I was especially amazed by the large concentration of Portuguese at one Tim Hortons, but more then the large concentration, was the male/female division with men sitting around one table, women around another. If the men were to break out a game of sueca (the card game), it would almost be like being at a Portuguese association clubhouse. 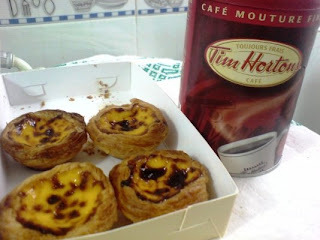 So it seems that Tim Hortons has conquered the Portuguese emigrant market in Canada as far as fast food is concerned. The question that remains, however, is: are the Tim Hortons people aware of the market potential when it comes to the Portuguese? Perhaps they would consider this suggestion as a donut substitute? subject offered by you is very useful for correct planning. in style since you definitely have the gift. specialists of this sector don't notice this. offered us with valuable information to work on.